We reveal the top hardware trends to look out for in 2017 and explains why automated products will make a big impact on the industry this year. Keeping ahead of the trend is important in any industry and any forward-thinking manufacturer or installer is always going to be on the lookout for new trends and opportunities. Keypad entry and wireless locking systems have been used in commercial buildings for years but it has only been recently that this technology has made an appearance in the residential market. The popularity of key-free locking has risen with smartphone use. The ability to unlock your home with your mobile phone is a convenience that appeals to the younger generation who may be starting to investing in property. However, there is still a preference for traditional turn-key locks, leading to the development of dual key-free systems that can be operated both with a physical key and via a keypad. The original features and design details of period properties are appealing to many homeowners. But those living in more modern homes look to timber effect vertical sliders and traditional style doors to bring character and charm to their property. Composite doors have boomed in popularity as a low-maintenance alternative to real timber, and demand for traditional style hardware has grown with it. Ornate handles, door knobs, letterplates and knockers are all high on consumer wish lists for adding that traditional touch to their home. 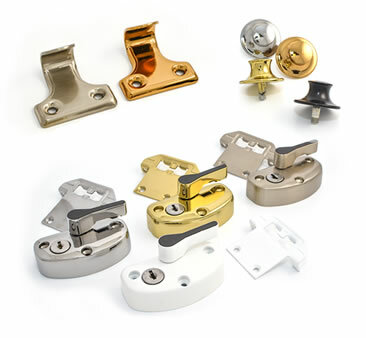 On the opposite end of the spectrum, for homeowners looking to add contemporary style to their property, modern hardware is in demand. Long bar handles, bow handles, D-handles and squared doorknobs all add to the contemporary aesthetic. It doesn’t matter whether it’s traditional or modern, homeowners are moving away from standard lift-lever handles in favour of something with more personality. Advances in colour processing means windows and doors can be coloured to whichever shade the homeowner desires. This freedom of choice has extended to hardware too. Gone are the standard white handles, replaced by multi-coloured hardware in popular finishes like chrome, brushed chrome and brass. But now chromes are giving way to warmer alternatives like burnished bronze and nickel, for both traditional and modern hardware styles. Windows and doors that can be opened with the push of a button might sound like something straight from the future but this technology is already here and ready to make waves in the window and door industry. Following positive feedback from the US market, we have been pioneering our automated systems in the UK after identifying a market here for automated windows and doors. We have launched a remote controlled automated casement window system as well as an automated VS system, which can also be used in sliding doors. Automated hardware represents a lucrative markets manufacturers and installers shouldn’t ignore. If you want to take advantage of opportunities in hardware, get in touch to find out how we can help. To find out more about Caldwell Hardware, you can email us or call 024 7643 7900.